Let us know the simple ways to rename the multiple files and folders easily in the windows operating system. Select the all files in the folder for which you want to rename. Hold Ctrl to select multiple files. Right click on the first one and select Rename. That’s it all the files will be renamed like this Color (1),Color(2),Color(3)……. Read: How To Recover Super Hidden Files From Pendrive Without Software. Select a file in the folder. Right click on the file and select Rename. Shortcut: Press F2 to rename selected file. Write your desired name to the file and press Tab key. On pressing the TAB key windows Explorer will select the next file automatically for renaming. 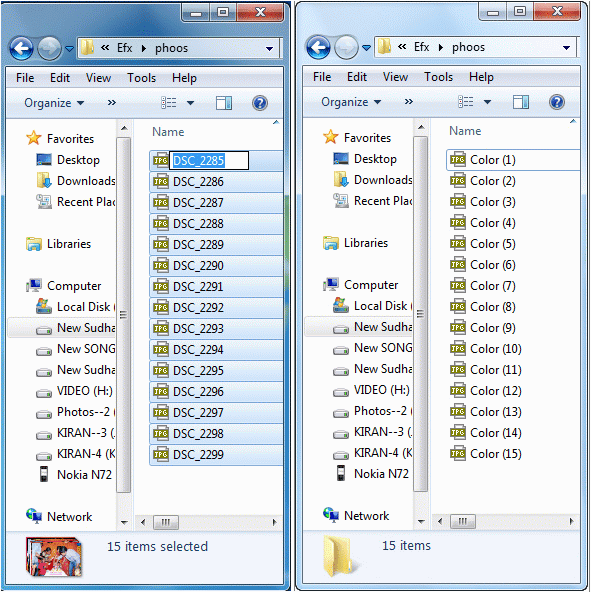 You can manually rename all the files in a folder to your desired names easily. Read: How To Enable / Disable Super Hidden Files And Folders. Share this useful tip with your friends. can this tips be used on window 8 ? Yes.., kamarul you can use these tips in all version after the windows vista.